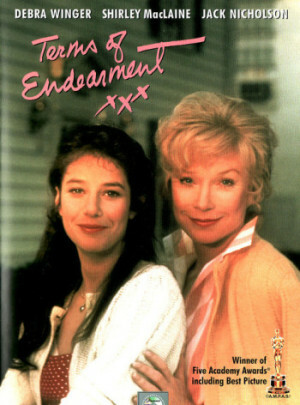 Today’s top movie pick, Terms of Endearment, is a 30-year-old classic still popular today. This Oscar-winning film is beautifully paced and wonderfully written, with complex relationships woven throughout. The dramatic subject matter will pull at your heart in ways that mothers will undoubtedly appreciate. Terms of Endearment (1983) was nominated for 11 Academy Awards, and won five, including best picture. It was written, directed and produced by James L. Brooks. The story revolves around Aurora (Shirley MacLaine) and her daughter, Emma (Debra Winger) who have a loving, yet volatile relationship that is pushed to the brink as they’re faced with the trials and heartache of life. Things become even more tense with this mother-daughter relationship when Emma gets married, immediately upon graduating high school, to Flap Horton (Jeff Daniels), a man Aurora completely rejects, evidenced by the fact that she refuses to attend her daughter’s wedding. As time passes, Emma and Flap find themselves struggling in Iowa, on Flap’s college professor’s salary. And, when Emma gets pregnant with their third child she reaches out to her mom for money. Not realizing Emma is several months pregnant, Aurora, tells her to get an abortion, further driving a wedge into their relationship. As time passes, Emma’s marriage becomes strained, mainly due to Flap’s infidelity, and she begins an affair with a married, older man, Sam Burns (John Lithgow). Meanwhile, Aurora becomes attracted to her next-door-neighbor of 15 years, the womanizing, alcoholic, Garrett Breedlove (Jack Nicholson). Aurora and Garrett eventually begin a relationship, but it’s tenuous. Later, Emma and Flap’s marriage is derailed when he’s caught having a fling with one of his students, Janice (Kate Charleson). Emma returns to her mother’s home in Houston, with her three kids, but their arrival doesn’t settle in well with Garrett. Emma reluctantly returns home to Iowa, hoping for reconciliation with Flap. Meanwhile, Garrett breaks up with Aurora, greatly upsetting her. When Flap accepts a teaching position in Nebraska, Emma ends her affair with Sam, and agrees to relocate with her husband. A shocking revelation ensues when Emma discovers that Flap is still having an affair with Janice. And, to make matters worse, Emma discovers that he moved to Nebraska to be with Janice. Later, after a routine doctor’s visit, the doctor notices that Emma has two large lumps under her armpit. A biopsy is ordered and we discover the devastating news that Emma has terminal cancer. Sadly, because of the malignant cancer, Emma’s lifespan is cut short. During this time Aurora is very supportive and loving toward her daughter, even though inside she is severely hurting. Garrett flies out to see Aurora and the two rekindle their relationship. Although the deadly cancer brings heartache and sadness to this dysfunctional family, it connects mother and daughter on a deeper level and we realize the strong bond these two really had. Most Memorable Mom Moment: Emma’s two sons are in her hospital room to say their last goodbyes. Her oldest son, Tommy (Troy Bishop) is clearly angry and resentful toward his mom. He can barely even look at her. But, even in his anger Emma reassures him that she loves him, and she knows that he loves her as well. She goes on to tell him that when years pass he should not feel guilty that he never told her he loved her, because she’ll always know that he did. Grab a bag of popcorn, pull up a box of tissue, and enjoy an amazing film. It’s definitely worth the tears.